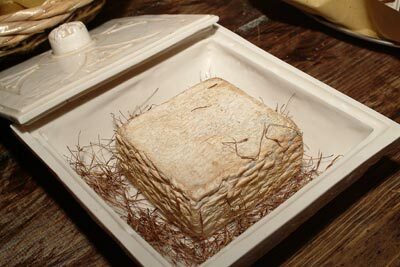 “Caciofiore” cheese is a sort of ancestor of the Pecorino Romano cheese produced using rennet extracted from thistle flowers. According to Columella “it is convenient to coagulate the milk with lamb or goat rennet, even though it is also possible to use thistle flowers or safflowers” (“De Re Rustica”, 50 A.D.). The vegetable rennet is the key factor in the production of this cheese. In fact, the protheolitic enzyme of the thistle flowers (Cynara cardunculus spp. cardunculus) characterises this extraordinary ewe’s milk cheese. A yellowish rind contains an almost liquefied centre, incredibly creamy and with an intense flavour, lightly salted and slightly bitter. The blue-purple thistle flowers are picked during summer and dried in darkness for 4-5 days. The dried petals are soaked in water for 24 hours and the infusion filtered through a synthetic cloth and added to ewe’s milk, kept at a constant temperature of 38°C (100°F). Coagulation takes place in about 1 hour and the curd is cut into big squares, placed in moulds and allowed to drain for 24 hours. The following day, the cheese is dry salted and transferred into ageing rooms for 35-40 days (optimal conditions: 7-10°C (45-50°F), 90-95% humidity). •Caseificio De Juliis Enio e Figli s.r.l. •Società Agricola La Baita del Formaggio s.s.
ASSOCIAZIONE FORMAGGI STORICI DELLA CAMPAGNA ROMANA | Via Giovanni Gregorio Mendel, 151 - 00134 Rome, Italy.